I have to make a fabric postcard for the monthly 6 x 4 lives challenge so I decided I would combine the two. This is the process I went through. Yesterday as regular readers know I posted a piece on paisley. This was a result of generally exploring the history and feeding my eyes. Sounds messy I know but that is what it is. I always spend some time collating together material and looking at what ever I am about to embark upon. After looking at these, digging about in few books, looking at my scarf and generally soaking in paisley motifs, I launched my copy of illustrator and started to draw a few ideas that I felt would be suitable for a fabric postcard. This is where the tongue poking out bit is important to the design process. This was a start. I needed something simple so that it could be the basis of an embroidery. Although this meets the criteria it is not quite what I wanted. 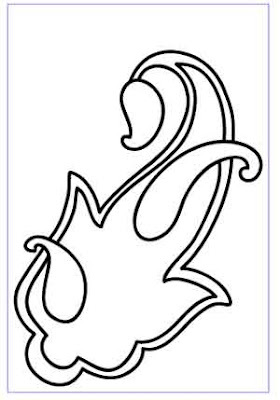 I liked this type of shape better but it was still not what I wanted. Both of these could be used as a motif on crazy quilting but I wanted something that was suitable for a fabric postcard. I wanted to relate the design to the context. In other words think about the shape the motif was going reside in. 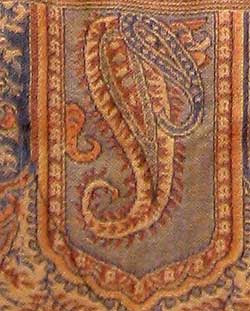 Then I looked at my scarf again and liked how in this section the small paisley motif on the left was cut in half. That gave me this idea of chopping off the motifs at the border of the fabric postcard. I started stitching it yesterday and this is as far as I have done. 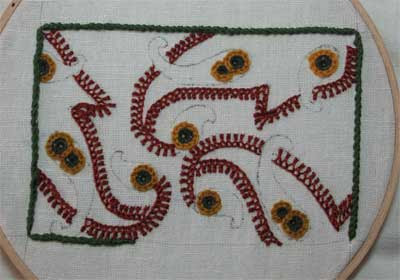 The stitch I used in the rust outlines is crested chain and I have decided to define the border with Portuguese stem stitch. At the moment many of the linear elements have not really been defined so it is not particularly well resolved piece yet. I know where it is going and I am not worried about it. I will post the progress made today tomorrow morning. These designs are here for anyone who wants to use them but I do retain copyright. That means you can use them but please do the right thing. That is, give credit where it is due. Credit me as the designer and provide a link to my site. Please don’t simply republish the images on your blog or website. Republishing images without permission is a copyright infringement even if you link to me. Many people don’t understand this. If you want to spread the word simply link to my site rather than steal. OK I will put my tongue away and I am off to stitch. I may be slow to join the paisley revolution. I call it half of the yin yang symbol?? but i love it. Thank-you once again to be part of your remarkable world. I think that your design would look FABULOUS in other materials as well. 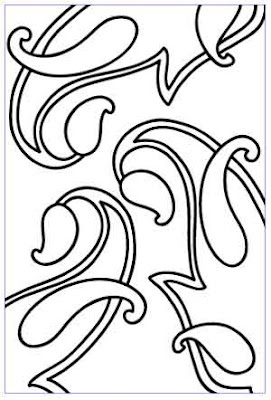 For example, I’m thinking of a paper cutout Valentine’s Card… since …. it’s the season. Or an art journal cover, or … OK. Sky is the limit. Anyhow, by either using thin lines with smooth edges or solid color blocks, the design will maintain a really pleasing crispness. Your design is inspiring to me, but that does not mean … it will actually happen in my world…** if ** I make something using your design I’ll let you know and post it on the blog, with a tag to your blog, OK, so you can see what I’m on about. Sharon, thanks for detailing your designing process. It makes it even more interesting to see what you are doing. I like the results of your efforts. It will be a beautiful postcard. Thanks also for linking to me now and then, when I do one of your seams in my own clumsy way. It’s very nice of you. I love it! I can’t seem to get enough paisley these days. I have added a paisley patch to the back of the jeans I’m working on and I think I’ll do a scattering of patches and stitched paisleys. I really like the way you offset your design and as always have enjoyed seeing the creative process. Kay – the stitching has taken on a mind of its own – its still sideways but definitely not simple. Sharon, I love all your designs, especially the last one. I’ve put all my motifs in the middle so far, you’ve made me think ‘sideways’! Thank you for reminding us about the colouring book! 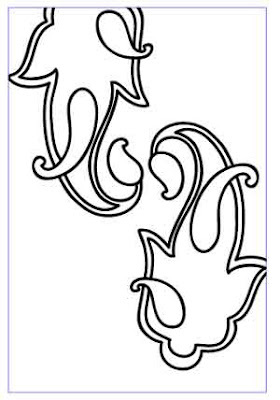 I keep simplifying the paisley motifs into line designs too, but now I find myself fascinated by those ones built up with stylised leaves and flowers, with no outline. Looking forward to the postcard. Would you believe- and I lie not- that as I read your opening line I had my tongue out in concentration. I kid you not…. The Paisley motif thing came about quite by accident. I was suppose to use paisley fabric on a swap bag, and I completely forgot, so embroidered one on there. It just grew from there! I guess your postcard deadline is looming, so we won’t have to wait too long to see your embroidered pickles. 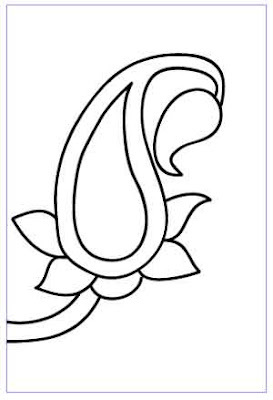 Sharon, I love your design – the negative space is just as interesting as the motifs. Can’t wait to see the finished postcard!